Use one of these mobile kernmantle cable systems to temporarily install a horizontal lifeline system on a pitched or flat roof. This lanyard is equipped with freely-moving carabiner hooks and is available in 3 lengths: 15 m (1 hook), 23 m (2 hooks) and 30 m (3 hooks). Our ABS Lanyard - temporary lifeline system was specially designed for horizontal implementation on flat and pitched roofs. This connector is based on a kernmantle cable which makes it considerably lighter, more compact and more user-friendly than traditional systems using polyamide cables. And that is not all our ABS Lanyard - temporary lifeline system has to offer. Most common anchorage devices deploy twisted cables. Not only are these much heavier than kernmantle ones - they also wear much faster due to their susceptibility to kinking. The kernmantle cable of our ABS Lanyard - temporary lifeline system, on the other hand, is significantly more robust and resistant to fatigue. Kernmantle cables never have any problems with kinking - and because our ABS Lanyard - temporary lifeline system absorbs less moisture than its twisted polyamide contemporaries, it offers greater weather resistance. 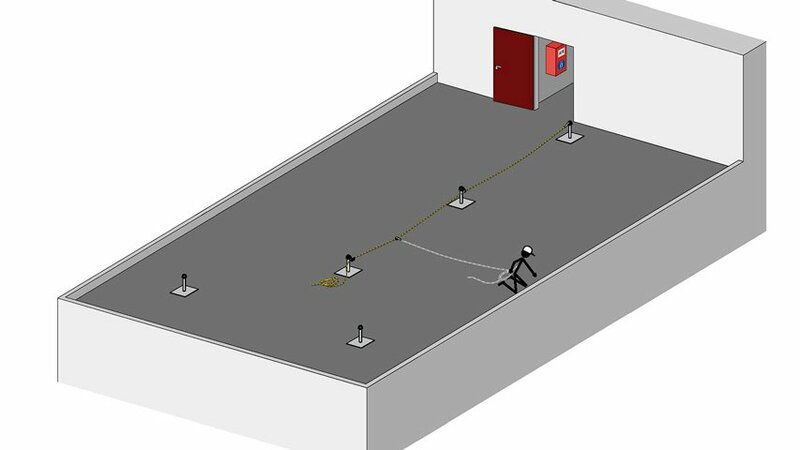 More advantages of our ABS Lanyard - temporary lifeline system: Firstly, this system has been approved for a maximum distance of 21 meters between two posts. Secondly, the kernmantle cable twists far less than a traditional cable, thus reducing the fall distance. 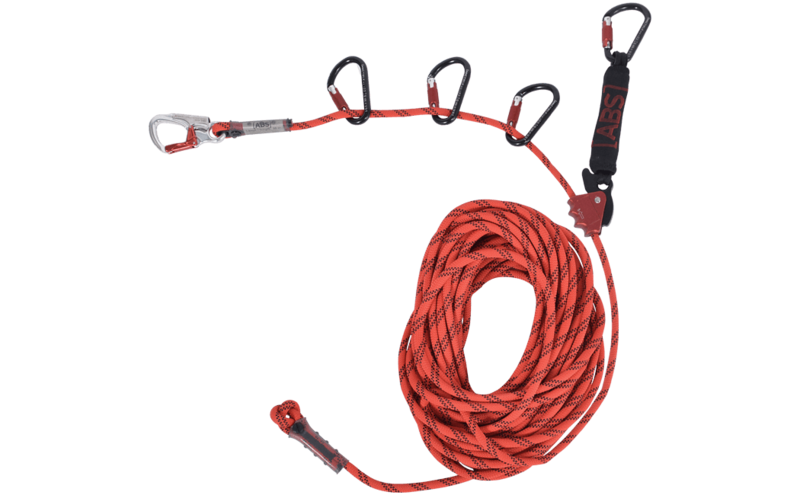 Our ABS Lanyard - temporary lifeline system was specially developed to secure up to 4 individuals simultaneously. A carabiner hook with a special screw lock is attached to one end of the kernmantle cable. This allows it to be quickly and easily attached to an anchorage point. A cable clamp is attached to the other end of the cable - serving as a tensioning element. In addition, our ABS Lanyard is also equipped with additional carabiner hooks which run freely along the cable and can be attached to intermediate supports. 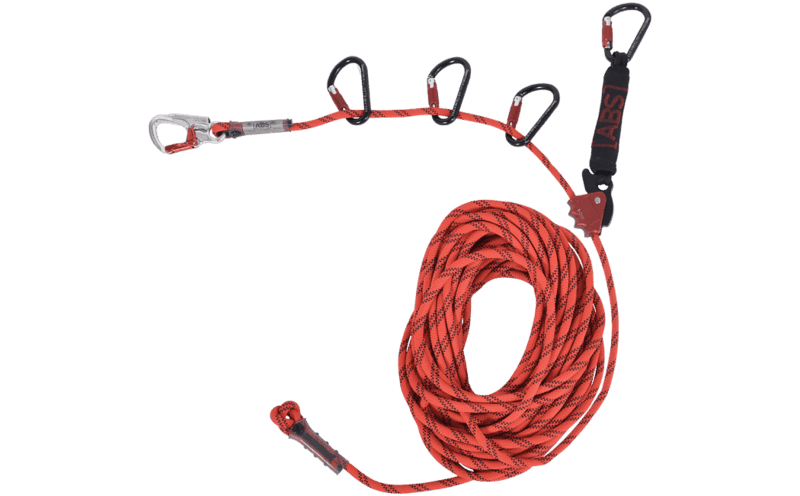 Our ABS Lanyard - temporary lifeline system is available in the following standard lengths: 15, 23 and 30 m. Use this connector system in combination with an ABS RopeGlide roller glider and a self-retracting lifeline for the perfect safety solution.